When Byzantine Emperor Justinian conquered Italy in the 6th century, he continued the building of a fantastic, octagonal church, the San Vitale Basilica in Ravenna. The church was a testament to the glories of Jesus and secondarily of Justinian himself and his wife, Theodora. The Basilica San Vitale still stands and it and its wonderful mosaics are in excellent repair. It is the only Byzantine church to survive entirely intact. Every square inch of the early medieval church is adorned with decorations, architectural features, and some of the most beautiful Byzantine mosaics in the West. The construction of the basilica of San Vitale was financed by a rich man by the name of Julianus Argentarius, about whom little is known. He was perhaps a private banker in Ravenna or alternatively a royal envoy of Justinian who was dispatched to prepare for the Byzantine conquest. In 525 AD, Orthodox Bishop Ecclesius of Ravenna initiated construction on the church after a trip to Byzantium with Pope John. The next year, Amalasuntha succeeded her father, Theodoric, as the ruler of the Goths, who controlled a large territory including all of Italy, and of course Ravenna. In 540, Justinian would conquer Italy and parts of Spain, and for a time they were ruled by the Byzantine Empire. Both Theodoric and Amalasuntha were of the Arian sect of Christianity , but she tolerated Catholics more than he. The Arians believed Jesus Christ was a creation of the Lord God the Father, not his co-equal in power and eternal existence, as the Catholics believed. The Goths under Amalasuntha allowed construction on the basilica to begin nevertheless. When Justinian reconquered Italy for the Eastern Roman Empire in 540 (it had earlier been part of the Western Roman Empire), he continued building the basilica and worked himself and his wife into highly symbolic and wonderfully crafted mosaics. Those two mosaics and others in the church, including Jesus Christ Almighty as an adult and Jesus as the Lamb of God, are testaments worked in stone and glass to divine power over the lives of the faithful. The halos around the heads of Justinian and Theodora do not testify to their divinity, but rather to their authority based in the divine Jesus. Some of the little mosaic tiles have gilding (gold) set between two pieces of glass. The Lamb of God mosaic is depicted above the altar, adorned with a wreath of victory. Lambs are among the sweetest, most gentle creatures, and Jesus is equated with them because of his good nature and because they were sacrificial animals in the ancient world. The church includes other mosaics of Jesus, each in focal areas and done in prominent display. Another mosaic depicts Jesus sitting on an orb. He is clothed in rich, divine purple robes and flanked by angels. The orb symbolizes the universe, all of creation, over which he has dominion. Beneath him flow the four rivers of paradise. He is holding a book showing the seven seals of the apocalypse. He is handing a crown to San Vitale, the martyr of Ravenna who was thought to have been killed and buried on the same site where the church is built. In the apse, nearly every surface is covered in richly symbolic images of holy figures, including some from the Old Testament. 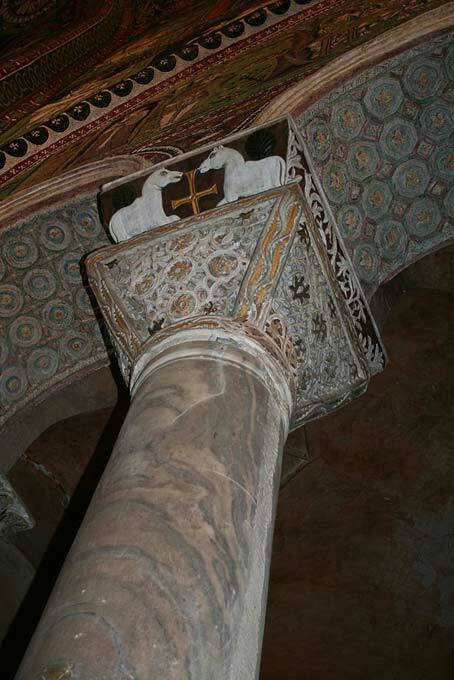 Where there are no mosaics in the apse, the marble is cut in decorative and abstract designs. 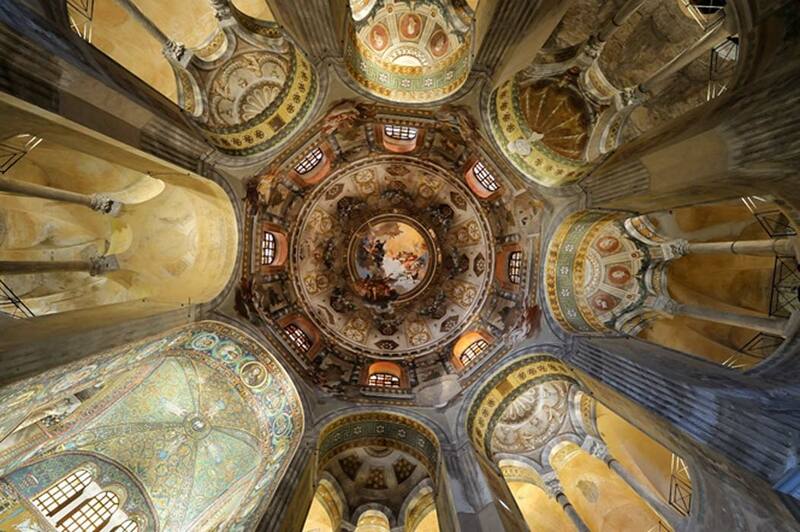 The Basilica of San Vitale is shaped as an octagon and has an octagonal dome in the center. 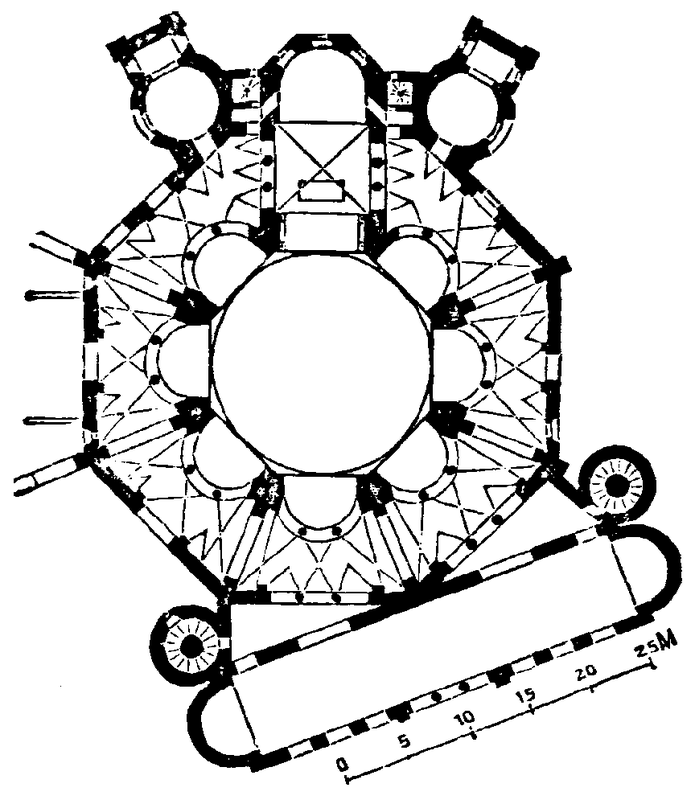 It differs from other medieval churches that are shaped like a cross or “t”. The church is one of the earliest to use flying buttresses to strengthen the structure. Saint Vitalis or San Vitale? Little is known of the life of Saint Vitalis. Stories say that he was born in Milan and buried alive in Ravenna. He is the father of the patron saints of Milan, Gervasius and Protasius. Legend says he encouraged Saint Ursicinus of Ravenna to die “like a good martyr” while Ursicinus was being executed. The persecuting judge noted Vitalis took Ursicinus’ body away for burial and ordered Vitalis tortured and buried alive. Valeria, Vitalis’ wife, also was martyred on her way home to Milan. The stories also say their children were martyred. An alternative legend says the church site was the execution site of another martyr, San Vitalis of Bologna. "In 540, Constantine would conquer Italy and parts of Spain, and for a time they were ruled by the Byzantine Empire."